summary: - Fixed an issue with Alliance or Horde icons showing at random in player bars. summary: - Fixed mobs showing when in Standard mode. summary: - Hotfix an initialization issue caused by a stealth patch in the client addon API. summary: - Death Knight: Epidemic, Scourge Strike and Howling Blast now has a better description on the spell name. summary: - Added size offset options for the chat tab embed feature. summary: - Removed bookmark tutorial popup. summary: - Added Cyclone to crowd control. summary: - Missing localization for the welcome window has been added. summary: - Attempt to fix a load file error. summary: - Fixing a red alert load fail which was happening for some users. summary: - Attempt to make the packager work. summary: - Changes to make the live version work with the BfA Beta. summary: - Fixed major issue with the statistics sharing. summary: - Created a safe dispatcher for callbacks registered in details events. summary: - Added a minimize button on the mythic dungeon chart window. summary: - Added outline option for the right text of the bar. summary: - Forgot to disable debug on mythic dungeons. summary: - Fixed dungeon chart at the end of a mythic dungeon run. summary: - Added run macro to disable arena team colors, use '/run Details.color_by_arena_team = false;' to disable it. summary: - hot fixes for the last update. summary: - Added suport to open plugins through macros, example: /run Details:OpenPlugin ("Time Line"). summary: - More development on the mythic dungeon chart. summary: - Fix for ticket #333: error on the new dungeon chart recorder. summary: - Added option to disable the mythic dungeon damage chart. 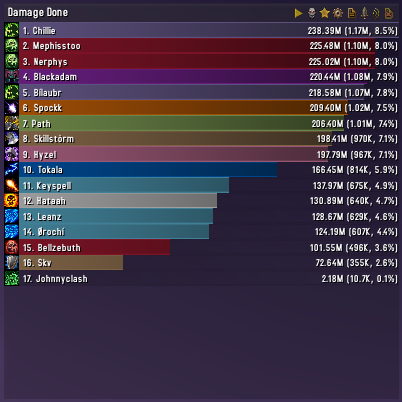 summary: - Added damage chart at the end of a mythic dungeon run. summary: - Added real time compile error while writing a custom script. summary: - Fixed wasted shield subtracting the total healing of the spell. This wasn't affecting the healing done of the actor it self. summary: - Warlock mana from Life Tap won't show up any more under mana regen, this makes easy to see Soul Shard gain. summary: - Framework upated to v63 (template parenting support). summary: - Default width for death window is now 350 (up from 300). summary: - Custom window should now clear the previous code when start editing a new custom display. summary: - Create Aura and API window moved to the new plugin window. summary: - Polish on the Custom Display and Encounter Details windows. summary: - Embeding the custom display window into the new plugin window. summary: - Fixed an issue with the statistics sharing among guild members. summary: - attempt to fix the argus encounter double segments. summary: - Hotfix the issue of getting errors when login in the game. summary: - adding stuff for the new raid. summary: - added new panel to consolidate plugins and panels from the main addon into only one frame. summary: - removed some already fixed debug lines. summary: - Fixed an error when clicking on the spec icon. summary: - Fix for ticket #262: unable to open the player detail window when streamer option 'no alerts' are enabled. summary: - Fixed green icons on the new feature 'event tracker'. summary: - Click to open menus now close the menu if already opened. summary: - framework update to v58 (looks like some author are adding words like 'topleft' and 'top' to the global namespace). summary: - fixed an issue opening the segments menu. summary: - Added several options and tools for streamers and youtubers. summary: - lib folder renamed. summary: - Rolling back to Mercurial repository. summary: - testing the mercurial repo packpager.